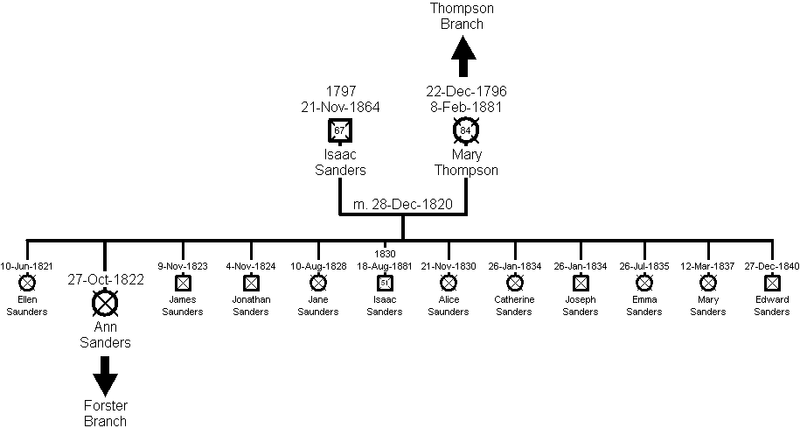 Please note: Some of the early information about the Sanders Ancestors has been retrieved from records on FamilySearch.org and a rootsweb message. Neither of which I have not personally verified. The earliest known Sanders ancestor is Isaac Sanders. Isaac was born circa.1797 in Marston, Cheshire. On 28 December 1820, he married Mary Thompson in Davenham, Cheshire. Isaac and Mary had 12 children, the second eldest, Ann Sanders, was baptised on 27 October 1822. By 1841 the family was living in Pickmere, Cheshire and Isaac was working as an agricultural labourer. On 21 November 1864, Isaac was buried at St Mary and All Saints Church, Great Budworth, Cheshire, aged 67. Mary was buried there on 8 February 1881 aged 84. Ann Sanders was baptised on 27 October 1822 in Davenham, Cheshire. She married Thomas Forster from Pickmere on 31 December 1846, in the Parish Church of Great Budworth. Thomas worked as a labourer and salt rock getter in one of the salt works in Wincham. Thomas and Ann had nine children. The third child was Ellen Forster born on 17 December 1849. In 1851 they were living in Pickmere Lane, Wincham; in 1881 Wincham Lane, Wincham and in 1891 Pickmere Road, Pickmere. Thomas died between 1891 and 1901. In 1901 Ann was staying in Thornton, Lancashire with one of her grandsons, Thomas Forster and his family.